Mike & Cheryl Nelson opened Ebler’s Leather & Saddlery Emporium on April 15, 2012, and is located on Main Street in Columbia State Historic Park. They specialize in a wide variety of quality leather goods including boots, jackets, belts, wallets, purses, and more. 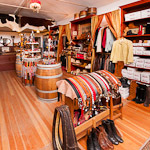 You will also enjoy browsing through their large selection of jewelry, western wear, and personalized souvenirs. Do you need a new saddle? Talk to Mike! You will often find him creating beautiful custom saddles or demonstrating the lost arts of leather work in his workshop located in the store. Michael and Cheryl also own and operate Brown’s Coffee & Sweets Saloon (also on Main Street, Columbia) and the Columbia Soda Works where the old-fashioned, and wildly popular Sarsaparilla Soda is made, bottled, and distributed.